Ever since my book club read Being Mortal, I’ve thought about what I’d like my elder years to look like (should I be lucky enough to have them) and what constitutes a good death, specifically, MY good death. And that leads me to consider, even more specifically, what I’d like to happen in the hours and days after I die. I’ve explained before that I’m not too keen on burial and my kids are not too keen on “carmation.” Curious about alternatives to embalming (in preparation for either burial or cremation), I came across a New York Times article about the home death movement. 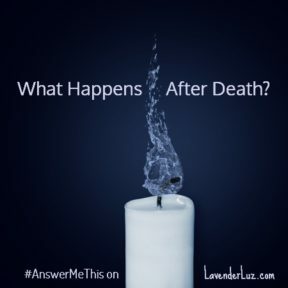 What do you think happens after death? Do you believe in a heaven and hell? An afterlife? 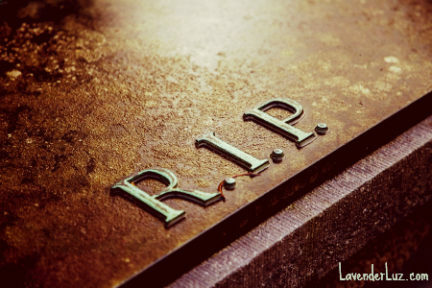 Ashes to ashes? Reincarnation? A combination? Or something else? 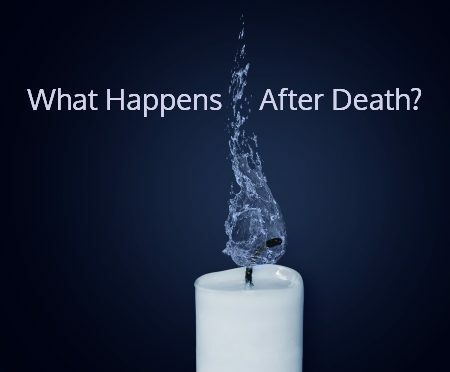 What do you think happens after a person dies? I’m not asking for any particular reason. It’s just that I find myself wondering about stuff while driving or showering, and my next thought is: what do my friends think about this? So I’m asking. I envision that the reunion of the soul and Source is absolutely, simply, magnificently divine, a sweet, long-awaited, and inevitable coming-back-together. My theory is that a person’s essence (spirit, soul) returns to Source and becomes undifferentiated from the essence of All. Like a drop of water (discrete) returning to a vast ocean (continuous). I favor the holographic idea of the drop and the ocean. The whole contains all the parts AND each part contains the whole. So I don’t really believe in reincarnation, per se (because the person’s spirit is no longer separate/discrete). Nor in Grandma looking down on you. In a sense, then, every body IS a reincarnation of All energies. The drop IS the ocean. And the essence of Grandma Marshmallow really IS everywhere. But those who love her (or orbit her) are most able to resonate with her energy, present still in so many tangible ways. This post is part of #MicroblogMondays? Whazzat? A post that’s not too long. Head to Stirrup Queens to join the fun. Truth be told, it was Jeni who made the first move. Before I drew a wider circle, Jeni reached out to me. I didn’t know at the time the extent to which she was a boisterous extravert, a curious humanitarian, a mushy marshmallow heart linked to a wickedly smart and witty mind. But I was soon to find out. hmmmmmmm. not sure if you’ll take this in the way it’s intended…. i like you. io REALLY do not want to like you, but i do. that is all i have to offer right now. oh….that, and i like your blog very much. That was the first contact between Jeni and me. Once I drew that wider circle in Jeni’s adopted city of Atlanta, Jeni and I became fast friends. We’d talk on the phone about her latest conversation with the nail lady or share with me a chapter of the memoir she was writing (she was especially proud of this passage about forgiveness) or when she was in the depths of despair about the double rejection of her birth mom (Jeni once posted that Sallie said she wanted to be notified of her daughter’s death by email — what kind of person assumes she’ll outlive her daughter?). Jeni came to stay with my family on a business trip later that year. Along with her service dog, Gracie, we took my kids to a festival in the town square and at one point Jeni and I were able to duck into a tavern for a quick drink on a hot day — a salty dog for her and a mojito for me. Oh, gawd, how I loved her laugh, her big, raucous laugh that vibrated through her entire being and was infectious to all around. Ever generous, Jeni brought me a designer purse that visit, which I happened to be using at the time of her death last week. Being a practical sort, I don’t subscribe to many fashion rules, but I do know that this purse is a fall-winter accessory. I can’t imagine transferring my stuff into something more springy now. Ever (but I’m sure eventually I will). That winter, Jeni returned to Big Moose in upstate NY, near where she grew up. 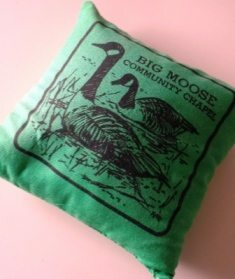 Jeni sent me a pillow made at a balsam bee at her church there. I wish it were possible to digitize the pillow’s balsam fragrance so I could share it with you. Smells like earthy love (not a euphemism!). 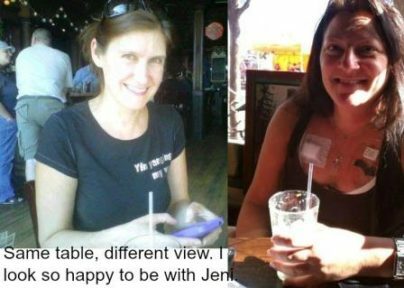 Jeni was not one to brag about her considerable accomplishments (except for one — she was going on 5 years smoke-free, and she did love to let us know the number of days via Facebook status). I found out about many of Jeni’s talents accidentally. She was a Japanese interpreter, having learned the language in school (I lived in Japan and lemme tell ya — hat’s off to her). While growing up Jeni was an accomplished ice skater and ballerina (if you are Friends with her on Facebook, check out this and this, but first prepare to pick up your jaw from the floor). She later was an impressive golfer, as you can see by the header she chose for her blog. And — news to me this past week — Jeni was once a popular disc jockey! I was really looking forward to reading that memoir she was working on. Jeni was a woman of greatness — great love, great loss, great breadth and depth of experience, great passion. Speaking of passion, Jeni loved Gracie and all animals fiercely, and she was on a personal mission to teach the law regarding service animals to anyone who gave her a hard time about Gracie (looking at you, taxi drivers and car-rental clerks). She campaigned relentlessly to open access to original birth records for all adoptees. She was known all over Facebook for reminding people small ways each of us can help the homeless (“Donation idea: when donating canned food, try to offer pop top cans. Not all homeless people have can openers.”). Jeni served as volunteer chef for awhile at a men’s shelter. Jeni and my daughter Tessa struck up a friendship. I have not yet told Tessa that her email penpal has died (but I will). Our last interaction of significance was when Jeni declared she would cheer for the Broncos in the Super Bowl. “You were my reason for picking the broncos!! !” — she told me. I filled her in that we’d recently gotten a dog, and showed her a picture of Dexter in a Broncos shirt. She was so happy for us, especially for Tessa, whom she knew had been lobbying for a dog ever since Gracie visited us. Oh, Jeni, what a bunch of happy memories you’ve left me with. I wish we’d made more. I didn’t know that would be our last conversation — that’s the trouble with lasts. Jeni leaves a simple legacy: Be kind. Carry that thought with you today. For my friend, Jeni. Some of us are sitting shiva for Jeni on March 27. Join if you’d like. And a fund has been set up to donate to Jeni’s causes: adoptee rights, an animal shelter, and a food bank.